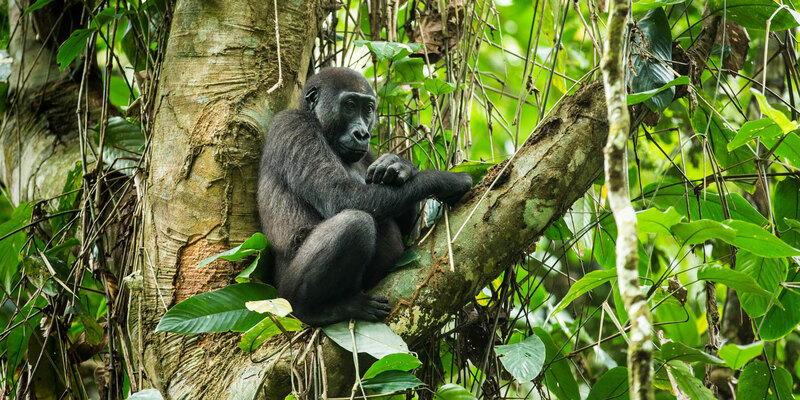 Republic of Congo is one of the best places on earth to see the highly endangered western lowland gorilla. The equatorial rainforest that covers much of the Republic of Congo is part of the larger Congo Basin. 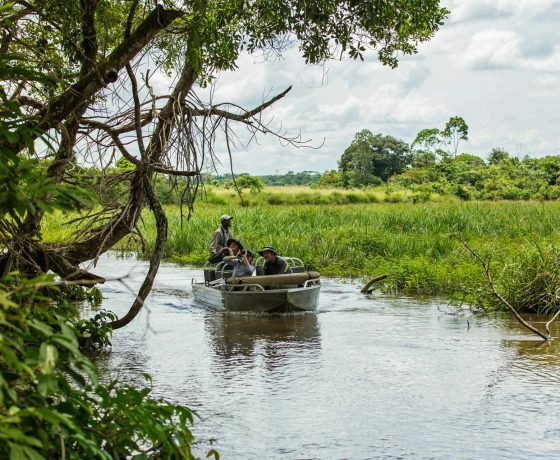 Threaded with rivers and tendrils of savannah that provide a natural home to a wonderful diversity of wildlife, this wilderness contains more than 1,000 bird species, 700 types of fish, and over a 10,000 plant species. 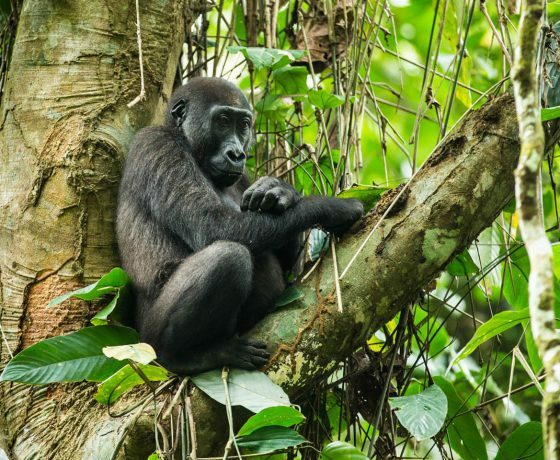 There are thought to be 100,000 western lowland gorillas in the Congo Basin, along with large populations of forest buffalo, forest elephant and bongo. 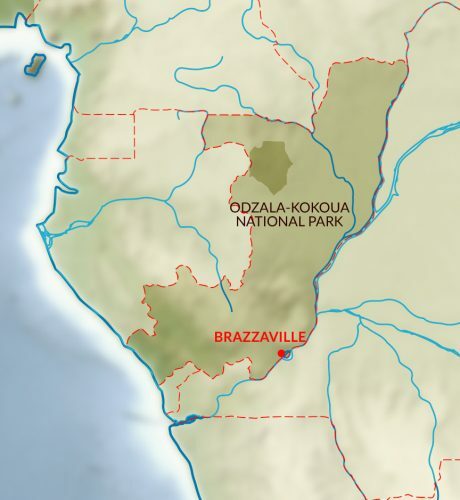 At present, the Republic of Congo’s Odzala-Kokoua National Park is the only place where it is possible to meet habituated family groups of western lowland gorillas. Established in 1935 it is one of Africa’s oldest national parks and includes within its 13,600 sq kms dense tracts of rainforest, areas of savannah, forest bais (clearings), and wide, lazy rivers. Game-viewing here is very different to that on a conventional safari because most excursions are by small boat or on foot rather than in a vehicle. This makes for a uniquely quiet experience with just the sounds of the rainforest a natural backdrop. 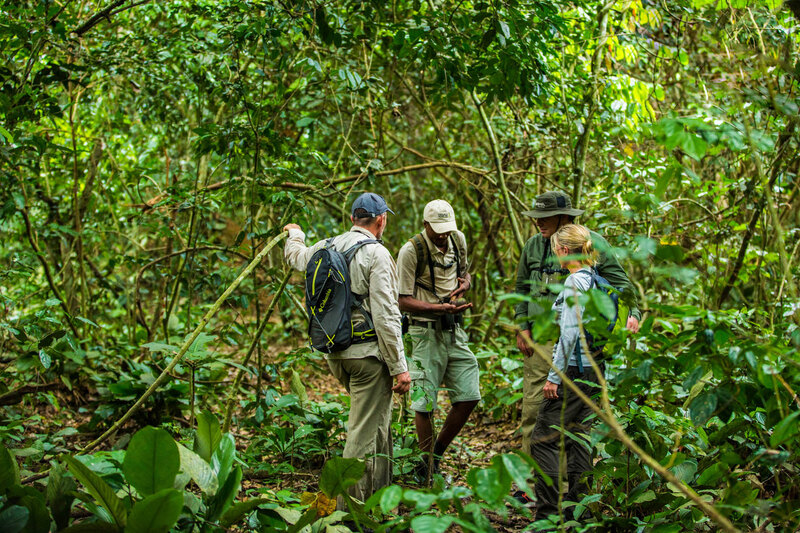 Wildlife encounters are richly rewarding and while tracking gorillas, other animals, including chimpanzee, various monkey species and countless bird species, are likely to be spotted along the way. Tracking expeditions do not cover enormous distances and can range in length from one to eight kilometres over undulating country. The contact time experienced with the park’s two groups of habituated gorillas is one of the most intimate experiences available in Africa and offers the opportunity for insight into the full spectrum of gorilla personality and community. Neptuno group has 16 individuals and the Jupiter group has 25 individuals. These groups are named for the silverback males which lead and protect them. The climate in the Congo is equatorial and the country’s terrain is relatively flat with low altitude, so it tends to be hot year-round. The experience does vary a little throughout the year according to the prevailing climatic conditions. Food supplies for the wildlife are seasonal, which affects what visitors can expect to see. There are two ‘green’ seasons, one from early March to the end of May and another from September until the end of November when there is greater rainfall. These are often the best times for photographers to visit as the rain tends to be sudden tropical downpours that leave the air clear with good visibility. With little fruit available at this time, both chimpanzee and gorilla reduce their range, while large numbers of forest elephant visit saline licks in the bais in search of minerals. 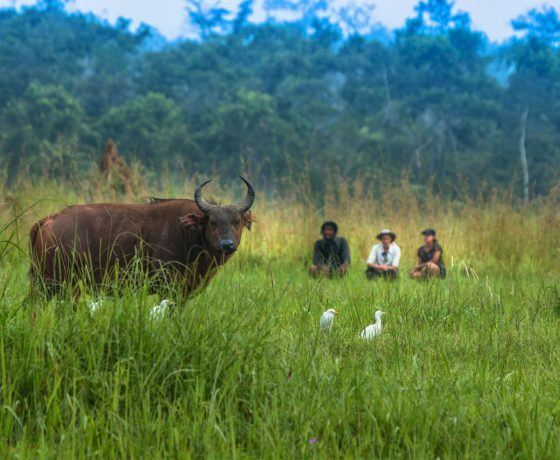 Lango Bai becomes an especially great place to see these shy forest dwellers. Clear blue skies allow light to penetrate deep into the forest where the abundant bird species breed during the rains. 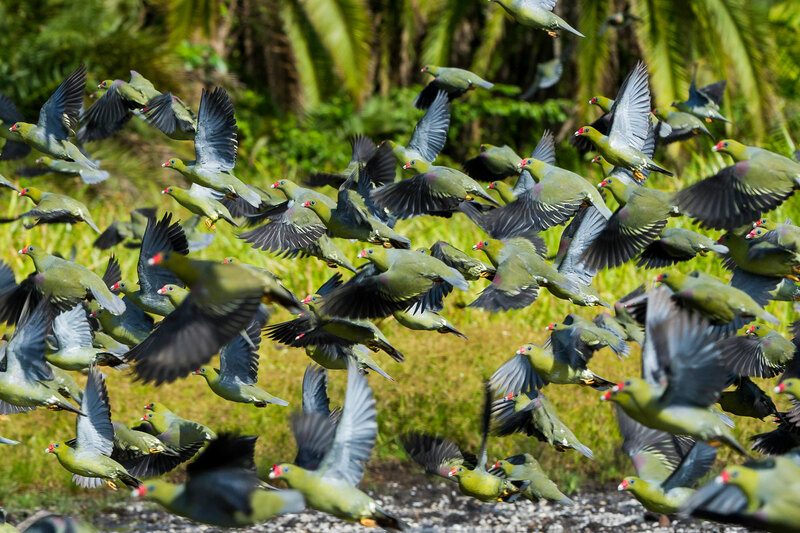 Numerous forest endemics can readily be seen such as black collared lovebird, vermiculated fishing owl, yellow lord bristle bird, fire crested alethe, and Guinea turaco. The drier seasons, from December to the end of February and June to the end of August, are cooler and less humid, but the air is often hazy. There is more fruit in season which encourages gorillas up into the trees, making them easier to see. River levels are lower but it’s still possible to travel the major waterways by boat. Elephant roam further afield in search of food, as do the gorillas, but chimpanzee sightings are generally excellent. 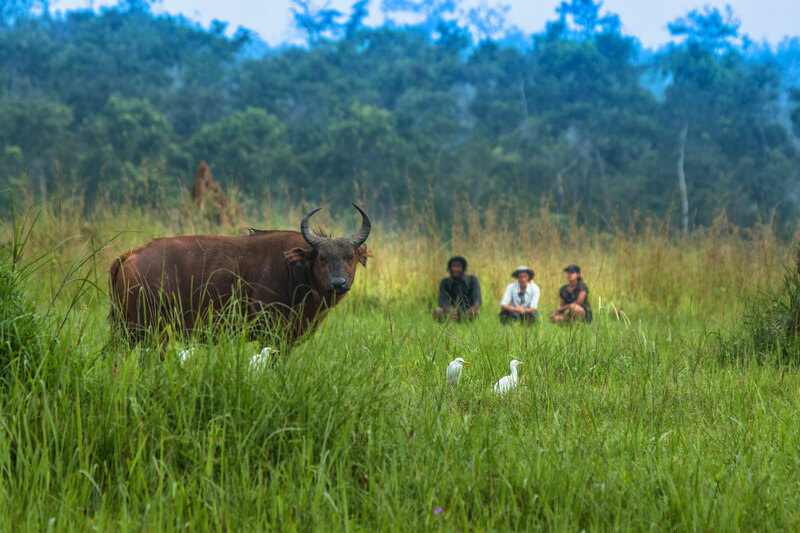 It’s also a good time of year to spot herds of forest buffalo as they wander between different bais. Harnessed bushbuck can often be found at Lango Bai as well. June to August is a key time for intra-African migrant birds and other residents, many of which are forest endemics. The shining-blue kingfisher, Hartlaub’s duck, great blue turaco, bare-cheeked trogon, black-casqued wattled hornbill, streaky-throated barbet, black and white flycatcher, shining drongo, yellow-mantled widowbird, yellow longbill and banded prinia are among the highlights. 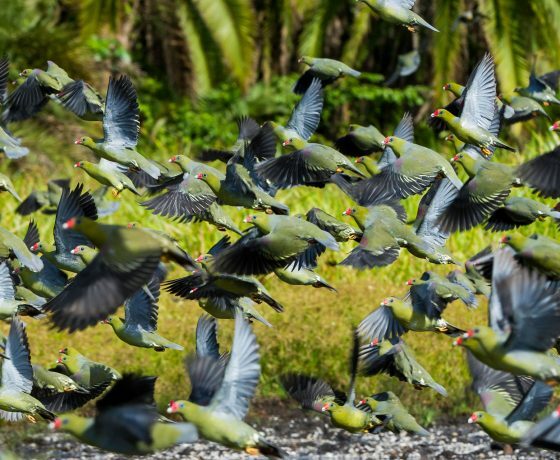 Birding is equally excellent in the forest and out on the savannah during the drier months. We had a fabulous honeymoon and can’t believe how cold it feels now we are back in the UK – landing at Heathrow felt like a real culture shock having been on the beach less than 24 hours before that. What a fantastic trip. This really is an excellent way to see wildlife very close to you. From the first time you put your canoe in the water you start seeing all the African wildlife you’ve dreamt of as you slowly cruise past them on the water. We had the most amazing trip! The flights and connections all worked perfectly, the camp was brilliant (Katie and the team at Macatoo are fantastic, we’d recommend African Horseback Safaris to anyone! ), the wildlife & countryside stunning and horses were perfect for Nicky and me. If you like a remote location well away from any other camps, Mwaleshi is your place. From the time you arrive at their airstrip, you are the only people for miles. The silence (apart from lions roaring at night and elephants ambling through the trees nearby) is magic. Highly recommended. A real passion to make this an amazing experience for us as a family. Nothing was too much trouble and Annelies and Scott were a pleasure to be with and very knowledgeable. They had thought of everything. Perfect island getaway. Had a villa on the beach at Dinarobin. Service was superb. Many thanks to Francis and the team at Aardvark Safaris. As described above, all the game drives were great, the guides superb, the camps wonderful. Top experiences…… mokoro and speedboat fun at Tubu Tree, along with seeing the leopard cub feeding, hippos chasing us and seeing wild dogs at Selinda, and quadbiking and meerkats at San Camp. An excellent itinerary ticking all our boxes at an affordable price. This was our first Riding Safari. The Camp Manager and her staff , and in particular our guide , were really marvellous. Nothing was too much trouble and we had a great six night stay. The horses are clearly well looked after and there is a large choice to suit pretty much everybody including novices like me. Accommodation was very good – Colobus Cottages were a very suitable place for a first night – not too luxurious. A nice English welcome and excellent food. (But be warned the owner is putting it on the market imminently so standards may drop). Mountain was good – on the upper slopes it is a truly interesting landscape whereas the first couple of days are a bit prosaic. With the benefit of hindsight I would have amalgamated days 2 and 3 and done the mountain in 4 days not 5. Our guide and porter team were all very friendly and competent. The Selous park was far and away our favourite on this trip.Nomad look like a really good outfit and strongly recommend that we use Aardvark Safaris if we are going to book one of their camps in future….which I am sure we will. All aspects of our Selous holiday ran to plan, thank you. WOW – what a “blow me away” trip!!! AardvarkSafaris did a beautiful job structuring this trip and staging it in such a way that it wasn’t overwhelming. This was a graduation present for my son and I had to drag him out of Africa kicking a screaming – he didn’t want to leave! Amazing experience. The guides were very experienced, providing good advice and ensured we made it to the top! The camp crew were amazing, ensuring we got good spots in each camp, providing amazing food (you wouldn’t believe how much food they can provide up a mountain) and the quality of the camp equipment was excellent. Would recommend this trip to anybody. Kilimanjaro is undoubtedly hard work but the views and sense of accomplishment make it so worthwhile! The quality of the guide company made it as enjoyable and comfortable as it could have been. Horses that knew their jobs, easy relaxing riding which we wanted, beautiful scenery. This trip was sort of an “experiment” trip for Borana and I think they will start to offer it in the future. The food was good everywhere. Didn’t quite understand why Chem Chem doesn’t serve pork or fish. As a result, there was a lot of chicken on the menu. Staff and service were always v.g. and very friendly everywhere-always a ready smile and nothing too much trouble. Awesome. A truly a memorable experience. We have high regards for Botswana just like Mma Precious Ramotswe in Alexander McCall-Smith’s No. 1 Ladies’ Detective Agency! We don’t often go back to places but this may be one of them. We had a wonderful time! The highlights were the Linyanti Bush Camp – we loved our time there and didn’t want to leave; seeing so many elephants was amazing; tracking a leopard a special experience and the helicopter ride a real treat. One of our party was quite poorly on our trip, but everyone moved heaven and earth to ensure that he got his game drives in, and saw his favourite animals, elephants. We will always remember a wonderful sundowner arranged by Henry and Sissa at Mara Camp. Reiterating the feedback I shared personally with Francis, overall an incredible one-off trip to Zimbabwe, thank you Francis. We always knew it would be a trip of a lifetime but it truly exceed our hopes, dreams and expectations. Again, Alice, Gale and team did a fantastic and thoughtful job for us. Each country was chosen for a reason and all those reasons were met. There were some wonderful moments – 90 species of birds, ostriches with 12 baby ostriches, sundowners on dried out Lake Manyara, Goshawk catching a snake as we ate lunch, just missing a python in a burrow, Al fresco breakfast under a baobab. All fab. Every day was different my own personal highlights were the close encounters with wild dogs on two occasions, four close encounters with different leopard. Encounters with numerous lions and the unbelievable amount of elephant in the Chobe Park area. 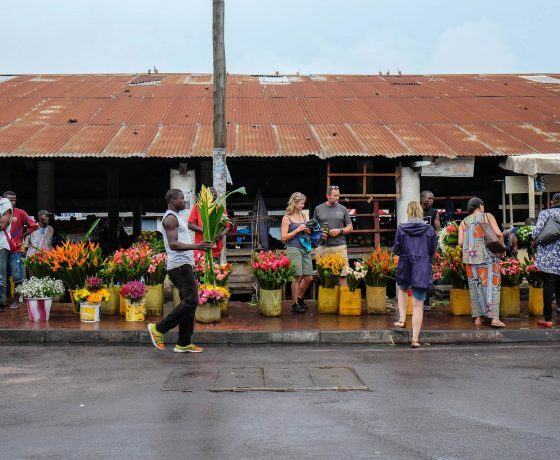 We spent two weeks in Tanzania, Zambia and Kenya with the arrangement from Aardvark Safaris. It’s a bit rush since I had a tight schedule. Aardvark did make a good itinerary for us to cover all the highlights for these three countries. Aardvark organised our safari from start to finish excellently. Their planning advice and pre-trip information were comprehensive, all travel arrangements and transfers worked beautifully. We would highly recommend their services. We only regret that we did not have one more day/night in each location! River rafting and zip lining the Zambezi river was truly a trip highlight, but the people and visiting the school in Hwange Park was a life highlight for the kids and us! I stayed in Kafunta Lodge, South Luangwa Park, Zambia, because a friend had been there 2 or 3 years ago and thoroughly enjoyed it. I enjoyed it too. It’s in an attractive location overlooking a big plane with a lake. From start to finish our safari was a wonderful adventure. Every camp we went to offered something different. There were so many highlights but not least the African sunsets. We never tired of them. We were taken out of our comfort zone on more than one occasion but it was fabulous. Many of the highlights listed on the camp pages. Very happy with all of the close-up photos of the various animals. Would certainly advise future guests to stay at least four nights in each camp to fully take advantage of all of the activities and surroundings. We last visited Robin Pope Safaris in 2008, this being our 4th safari with them. We love the Luangwa Valley and our main reason for patronising RPS has been the superb standard of guiding. We were reassured by this safari that nothing has changed. The game roaming around the tents at night – great fun trying to identify by the prints in the morning – this time zebra, hippo, wildebeest, impala. Seeing leopard and cub – this is always so special. Also the lions and their two month old cubs playing. We asked Aardvark to put together a safari where the camps and their environments were quite different from one another. 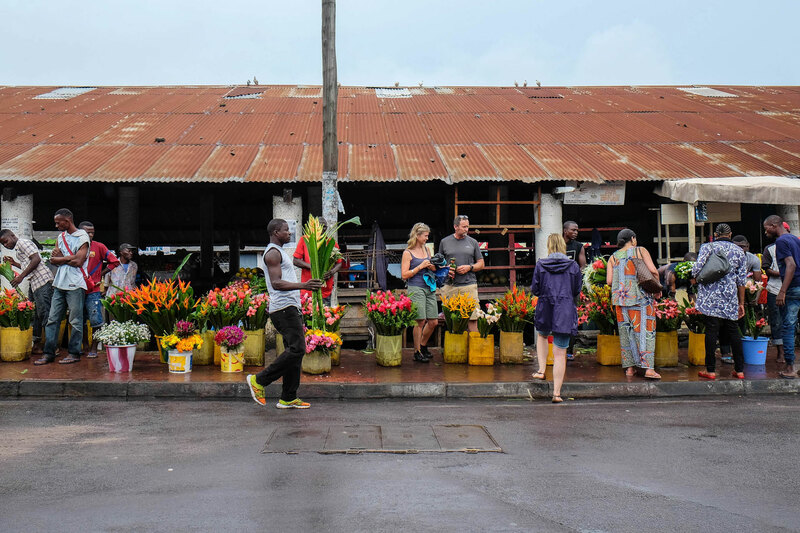 We didn’t know if we’d ever get back to Africa, so we wanted to have a lot of variety during a 3-week trip. They truly excelled! The staff was incredible! Horses well taken care of and very responsive. Bongwe was an excellent guide. Highlights: getting close to animals (lions, cubs, elephants, hyenas, hippos), cantering through water, beautiful and delicious surprise meals out in the bush, the sweet and nice people, sundowners in magical places, etc. A trip of a life time! Hakuna Matata! Loved this trip. Still seems like a dream. Kari’s favorite part was seeing how cuddly the lions get with each other when they’re sleeping during the day. The biggest highlight for me was getting to see a lion hunt during our first evening at Mchenja. This was a great three week trip including six safari camps, Victoria Falls, and Cape Town, planned by people who knew what they were doing. Every camp had different owners and very singular personalities. The camps were small and not always easy to get to but the volume and variety of animals I saw, and the comfort level of the facilities, was much greater than what is available on the 12 to 20 person packaged tours. Tents were nice, service was excellent, food was very good, horseback riding was amazing! Lots of little surprises! Great wranglers. Kigelia: Grumpy elephant very close to dining tent, cheetah kill by camp fire, windy giraffe outside tent in middle of night, Kelvin’s amazing cooking skills, all the guides. Beho Beho: Location, stunning open fronted Bandas, all the dining as we ate in a different part of the camp everyday. A few wonderful surprises were thrown in to keep us guessing. The guides again were fabulous as we got to know them quite well. Letaka was the highlight of our trip and our guide Michael Turner was exceptional. The whole team made our mobile experience 5+ star – just myself and my nine and ten year old children in a tent at night listening to the sounds of the bush is unforgettable. We stayed also at Camp Linyanti at Linyanti by Chobe which was a lovely lodge on the edge of the river – great option to go in boat or car to safari. Great food and lodge staff excellent with children. Highlights included: seeing my first male lion in the wild – WOW, it made me cry! Brunch with hippos with Trisha and Robin in the Masai Mara two days running. Zebras, giraffes, lions, a cheetah, leopards, elephants, birds and a mass of wildebeest! Everything went as expected and planned, and the quality of the accommodation exceeded our expectations. Excellent in every way. Well, once again Aardvark deliver the perfect safari – don’t you guys ever slip up! I did seventeen nights in four different camps and it was just great. It was a bit different to what I normally do, but in saying that, I wasn’t disappointed in the least. Apart from the journey home everything was brilliant and even that was well sorted by Aardvark and Breezes. Our highlights included the crater view, leopards mating in the Serengeti and the camp fire singing. Fantastic trip. We loved the walks in the national parks and saw lots of lemurs and birds. All the places we stayed were excellent with friendly staff and good food and our guide was very good, knowledgeable and helpful. No WiFi, generator at night for light, but it was wonderfully refreshing! The tents had to be triple zipped and locked to keep the baboons out. The horseback riding was spectacular. Galloping through the Okavango delta and yes, you get wet! SO much fun. The main object to this holiday was riding for Emily my 18 year old granddaughter. She had a truly wonderful experience at both lodges riding amongst elephants and giraffe and very close to rhino, jackals and many other animals. Fabulous time had by all! Very keen to return one day. The camps/lodges were all great…and all gave slightly different experiences. The wildlife we saw in Zambia was extensive – and much more than people we met who had chosen to visit Botswana! The walking safari was absolutely the highlight just because we’d never done anything like it before and it is the most amazing experience to be walking through such complete wilderness for five days. We didn’t see another tourist, a vehicle or even a vapour trail in the sky. We had the BEST GUIDE in the world. Pat was knowledgeable and fun. He worked hard to locate all the animals we wanted to see, and we got to see so many animal interactions that were amazing. Pat even told us about the night sky and all kinds of trees and plants. We intend to go back to Botswana, at some point in the future because we loved it so much. You didn’t ask us about Sandibe (for obvious reasons – it won’t be there in its present, temporary form in another 10 days or so), but the ‘mobile camp’ with its resident elephant was very enjoyable. Safari was the obvious highlight, with some great sightings, sundowners delights, and Brian, also great was Molly’s bungee off the Vic Falls bridge – but the deck at Kapani Lodge, with drinks, animals to see, friendly staff chatting, dinner, breakfast cooked by the chef in the fire pit, and the lovely brunches were such a pleasure. Like I said to Ronnie, it was definitely our trip of a lifetime, and it didn’t fly by, it was just perfect amount of days at each place, exactly like you planned it Tor. We met some interesting people. The guides were all very very good and had some great knowledge. Top things: eldest son arriving for the middle week by helicopter and going to watch it arrive on the 14th hole of the golf course. Mauritius and Le Paradis – friendly and welcoming at all times. Enzos -a restaurant at La Gallette – very friendly and good food, nice to get out of the hotel sometimes. I don’t think there are words to describe how special this trip was for our family. Our guide, Pat, was exceptional. Not only was he extremely knowledgeable about the mammal, reptiles, birds, insects but also geology, astronomy and ecosystems. Pat has training as a educator and was able to teach us all everyday about more in depth topics related to the region. One of the best family holidays we have ever had! Highlights were obviously the animals. Livingstone was a soft landing and so good with the kids after a long flight. I would have been a bit disappointed to have done that at the end of the trip (ie in my opinion it’s not necessarily worth the extra flights and travelling time just to see the falls). This trip was more than we expected. We came on this trip to spend time with Derek’s parents and to give them a chance to fulfill their dream of having a vacation in Africa. We expected to see animals and enjoy our time but it was so much more. We were given a unique look into the lives of the animals in a variety of different ecosystems. Where to start. It was all so fantastic. I heard about the Letaka Safaris at an airport in Madagaska whilst chatting to a couple who had just been on a Botswana safari with them. Their comment was “the animals were almost too close for comfort”. How accurate they were. I have the best time of my life. Africa is a great continent and their people are the greatest. The choices you gave us regarding the destinations, the sequences and the timing were perfect. Thanks. Guides were excellent, helpful, informative and listened to what we wanted to do. Always someone there to look after us. Baraza is outstanding but could be anywhere as not advisable to leave the resort without a guide, having said that we have never encountered that beautiful white sand and warm sea before. Excellent experience with Victoria at Aardvark Safari. I have crowed a lot about her already. Safari was unique and unforgettable experience. I would love to repeat the trip. Only regret is that I was not always ready with video when elephant trumpeted, or charged (mini) at us or lion charged (mini) at us. We had a number of incredible highlights, such as seeing a lioness released in Chobe after she killed a farmer’s goat. Also, I’d love to write about our trip for you magazine. I have a slant on elephants, which were my favorites: Never hire an Elephant as your Gardner. Beho Beho – Sunset with a gin and tonic whilst watching Lions on the edge of a small river cliff. Breakfast on the shores of Lake Tagalala. The safari in Botswana was first class. Annelies and Scott (our guide), together with the camp staff, looked after us very well. We went with no expectations or particular wishes and they seemed pleased they could just relax and show us what was around. Overall a great experience, we have traveled around a lot of the world and Africa has been on our list forever. Cape Town was much nicer than we ever expected and Zambia was perfect for us. We absolutely loved Sindabezi and the accommodations. The Lower Zambezi was nice but we felt the South Luangwa was much better. A brilliant trip – a mix of adventure and wildlife and sightseeing. As our “last” family trip before the kids go to university it could hardly have been bettered. I really enjoyed the safari. the horses were good and the guides very helpful. Food and hospitality were excellent. The only niggle was the days when we moved camp were very long. One day was too long and very tiring. Lots of great sightings. Baby hyena was great. There were no real lows. It ran like clockwork and was all so much better than I had hoped for. The flights all worked and mostly on time as anywhere. Watching lions eating an elephant, my son bungee jumping, sitting in the water on the edge of the Victoria Falls, catching tiger fish and the surprise at the end. We had a great time on our safari with Drumbeat. There were some truly amazing wildlife experiences (seeing lion, hyaena and wild dog cubs/pups, a leopard stalking guinea fowl and wild dogs hunting to name a few) and our guide, Moss, was very knowledgeable. We were very impressed with the wildlife and tourism in the Okavango Delta. We were often the only vehicle in sight and rare species such as leopard and wild dog appear to be relatively easily seen. More expensive than other African countries but hard to complain when the experience is of such high quality and the country seems to take conservation very seriously. Overall we were very pleased with our first safari vacation, I don’t think we could have done any better. The people of Zambia are so friendly and helpful (and are very proud of this) that we always felt welcome every place we went. All the meets and greets went off without a hitch. Our trip was probably the best I have ever experienced and I have been all over the world. If I go back to Africa I would love to go to Greystoke Mahale and Zanzibar. Since we were not ready to come home I wish I had signed us up for Zanzibar. Perhaps later. Highlights were: Cheetah Conservation Fund visit — we would have liked more time there; Etosha wildlife — especially watching elephants and seeing both black and white rhinos; The waterhole at the Okaukuejo Rest Camp — We could have stayed there two nights and skipped a day at Swakopmund. Summits Africa were the best. Ake and the team prepared us for the summit mentally, physically, and emotionally. Very supportive. A great introduction to the people of Tanzania. Loved the singing and cheerful attitude of the entire staff. Thanks to the expertise of Aardvark, I had the most amazing time in Botswana (African Horse-riding Safaris) and South Africa (Ants Hill). One of the best family vacations we have had. Getting to and from Africa does require a lot of travel and work from California. Would recommend some down time after arrival to adjust (which we did and were happy for). Might think about direct flight next time although transit in Dubai was easy and seemless – as tall chap quite nice to stretch out legs for second leg. First time and certainly will be coming back.&nbsp; Professional and thorough. Made my life so much easier. I would definitely recommend a safari vacation and hope to go on another one. The number of animals and birds we saw was astounding. It was incredible how close you can get the animals, a little scary even sometimes. The guides are so knowledgeable, and I feel like we all learned so much from them. Ben and his crew were amazing – highly recommend using them again!!! So friendly, great at their jobs, and were willing to get to know us and let us get to know them. Calm, flexible, knowledgeable, everything anyone could want!!! Unforgettable and a beautiful experience. We had the most fabulously knowledgeable guide and loved that were weren’t on a convoy tour. This was the most outstanding, memorable, perfect family holiday we have ever had – and everyone of us, from the youngest child of 6 to the oldest ‘child’ of 30, we were all so blessed and inspired by what we saw, who we met, and every activity. To pick one highlight would be impossible. Having experienced three such different experiences, each with its own breath taking moment would be impossible. For me though, to see a herd of elephant for the first time in their natural environment, cross a river, the young holding on to their mother’s tails was momentous. My daughter and I had a wonderful experience with Letaka Safaris and would highly recommend using them for the best experience in northern Botswana. All the plans were made by Aardvark Safaris and there was not a hitch. The group we were with were from England and Europe and we were well matched with adventuresome spirits. I thoroughly enjoyed the vacation and so did my daughter. I would recommend going to Botswana because I think that it is not nearly as populated as Kenya or Tanzania. We saw 37 different animals and reptiles and 65 different birds. It was better than expected and we had high expectations. What an experience! Traveling in a fairly large group did not prove to be a problem. The Serengeti Plains were beautiful. The drive to Musoma was rough but worth it. Lakuba Island and the village residents were warm and welcoming. The students had an especially good time, interacting with the village children. We had such an amazing experience, it was my first time on a safaris and I could not have imagined the amount of animals we saw and the level of comfort provided in the camp. We were very lucky to be the only guests during these 7 days. Our stay at Beho Beho was the highlight of our trip. Great game sightings, fun day at Lake Tagalala and swimming in the hot springs of Maji Moto, beautiful sunsets and enjoying candlelit dinners in a different location each evening, our surprise bubble bath and champagne under the starlit sky. Our Family (which included three grown sons) took this adventure together and could never have realized all we would experience in such a short amount of time. We started at the beautiful Tongabezi Lodge in Zambia, a visit to their local school, cruises on the River, a safari through a National Park and even a trip to Victoria Falls. A truly amaaaaaazing holiday….packed with unforgettable experiences. Uganda and Rwanda are both so stunningly beautiful. Rwanda is truly inspiring in how it is ‘re-building’ after the Genocide in 1994 – very special people – very humbling experience spending time with them and visiting the Genocide Museum in Kigali. From pick up at Maun through to the final night stay at The River Club, my experience with Wilderness Migration Routes was nothing less than spectacular.I had the good fortune of being aided throughout my adventure by a jovial and knowledgeable guide (Mr Emanuel) who took great pains to ensure the needs of my group were met on a daily basis. A trip of a lifetime. Gorilla treks were superb. I recommend at least two treks so different gorilla families can be compared plus the volcanic regions were different. Kigali and surrounding countrysides are very clean. Guides are first rate and knowledgeable. My first real safari in Africa. I have been on short ‘safaris’ in Sri Lanka and India which I very much enjoyed because we were trekking on foot or elephant and therefore less noisy than by vehicle, but here with the distances involved (and safety) the vehicle was essential. In Kigali we visited the local Inema Art gallery and met artist Emmanuel Nkuranga who founded the art center. There is a small gift shop located inside the gallery. We also visited the Kigali Genocide Memorial and from there went to the local craft mark where we purchased gifts. Big skies, long gallops, picturesque landscapes (no photo album of mine been such a big hit with people), chance to develop a bond with the horses who are the real stars of the trip. From being picked up in Nairobi to being delivered at Masai Mara we couldn’t have asked for better service and care. The wildlife was incredibly plentiful and way exceeded our expectations. It was PERFECT. We had been a touch nervous about being too tired for an energetic safari… No need for this – it was ideal for a honeymoon! We were early to rise every morning, but watching wildlife from a jeep / boat is plenty relaxing enough. The safari was fantastically organised right from the moment we landed in South Africa. We were met by the driver at the airport and driven to Botswana where we were met by our guide for the week. He made sure we got through the border control properly and then took us to meet our horses. The only low was South African Airways service was terrible and the delay out of Senegal made us miss our connection in Dulles but nothing Aardvark could do about that except maybe encourage your clients not to fly South African. The highlights are too many to count but I must say the guide at Letaka, Joe Ramsden, was first class. If I could give a rating higher then 5 paws, I would.The camp was very organized. Annelies was extremely welcoming and very approachable. We had great conversation around the fire and at dinner. Overall, the trip was fantastic. We experienced so many things and got to see a large part of northern Botswana. If I were to do it again, I think I’d probably want to stay longer at each camp site. Only having one full day at each site probably was a bit too short. But it is a trade off of trying to see more areas with the amount of timemoney we had. Annelies and her crew were fabulous. Attention to detail is Annelies’ strong suit. Everything was First Class. Out of the 6 of us, five are seasoned safari-goers. Everyone was impressed with what we saw, where we stayed, what we ate, etc. This trip exceeded our expectations. The highlights were the gorillas and the only low was having to leave them! Totally amazing. Worth every penny. Africa is therapeutic. The colour, the light, the sound, the smell. There is always something to see. Wilderness safaris are high end and well worth the money. Transfers are slick and worry free. All camps work to a standard which ensures quality. My whole safari experience was more than I could have ever imagined. Some highlights included eating breakfast out in the bush and having elephants join me just across the river, seeing leopards mating, and going to the Sheldrick Elephant Trust. The ‘best week of my life’ is an understatement. So many happy memories I’m not sure where to start… From the time we arrived I felt completely looked after and realised very early on I was in very good hands. The staff were totally amazing. This is our third visit to Kenya in just over a year – we love it! We really enjoyed the whole time , the lodges, the food , the staff at all the lodges an dour tour guides were great, the gorilla tracking the icing on the top! We will treasure the experience with the gorilla and chimp tracking for ever! The highlight was definitely Sarara – the camp, the management, the game drives and walks and the friendly and relaxing atmosphere. Lake Manze as a camp was disappointing but we had good game drives. Dawn everywhere was a spectacle and everywhere different but particularly stunning on the Indian Ocean. We loved the whole trip!!! The people of Uganda and Rwanda were very friendly, the countries are beautiful, and very blessed to have the wildlife they do. The Mountain Gorillas are just amazing! Far exceeded expectations! Excellent – loved it. Great mix between safari and beach. Travel arrangements worked well. One of the best family holidays we’ve had. Thank you. Gosh – two weeks is too long to encapsulate here. I already did most of it in my email to Charlie with the pictures I sent to him. The trip was excellent. In fact, Erin took a lot of video, and she plans to make a DVD of Audrey and Erin’s Excellent Adventure. Gosh – two weeks is too long to encapsulate here. I already did most of it in my email to Charlie with the pictures I sent to him. The trip was excellent. In fact, Erin took a lot of video, and she plans to make a DVD of Audrey and Erin’s Excellent Adventure. The gorillas were the high point for me. Overall our Kenya trip was excellent. Highlight was at the Elephant Watch camp where we saw leopards. The guides at the Elephant Watch camp were extremely knowledgeable of the area, tracking and the animals. We felt safe at all times which is important and would definitely go back…loved it. Top time, great guide, excellent service, VIP worth the extra money. Confusion re inclusion of tips was only negative but sorted in the end. A truly magical holiday!! The variety and the quality of the organisation, accommodation and people as well as the exceptional nature and beauty of Kenya made this trip a once in a lifetime special. Just the whole experience from being met at the airport , transferred to accommodation, day by day adventures and returned back to the airport – you just can’t beat it. We got to see things we have not see before – Pelicans on the Mara! Fred was brilliant with identifying birds so we got to see Kingfisher (three different types) and two separate Leopard spots – one on the first day and one on the last – absolutely perfect. The trip was everything I had hoped for. Great photography opportunities, great lodges with great people running the place and great guides. The travel went very smoothly-including the international and the safari flights. Again, Nairobi traffic during weekdays should be avoided if possible by Sunday arrivals and departures. The camping was great fun, including the open air showers and loos, although trying to have a siesta in tents in 35 degree heat was a tad tricky! 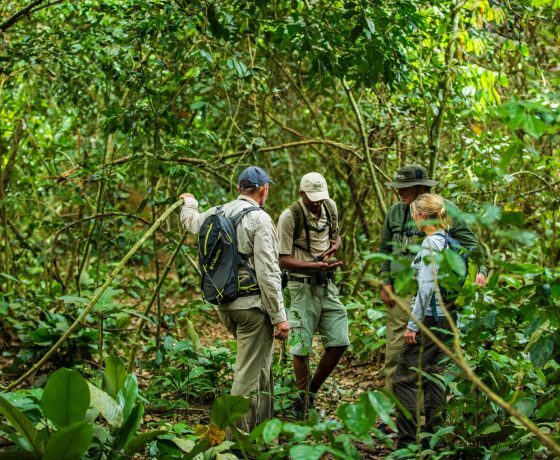 Shadreck was a fantastic guide, so tuned in to the sights and sounds around him that we saw over 40 large species of animal and 150 species of birds. We were going for scenery and we got it in buckets. Climate perfect for us, good balance between “doing” stuff and relaxing. Only criticism we would have was Swakopmund restaurants. Both rather tired places and there are better options listed on Tripadvisor. Our climb was an unforgettable experience. We were amazed by the fauna and flora seen on Mt. Kilimanjaro and appreciated the stunning views. The Lemosho route had very little traffic so the camps were pleasantly quiet. It was a truly amazing holiday – the mix we had made sure there were many unforgettable moments and something to suit us all. The location of Kasaka and having the river activities was quite a favourite, but also the experience of staying in the Treehouse. We had such a memorable holiday in Namibia and so much of our memories are down to the support and care provided by our guide who was with us for the duration of the trip. We were travelling with four teenagers and the drives on average were a minimum of four hours maximum of six. The wildlife in the Mara was a big highlight- seeing cats for the first time close up was one of the reasons we decided on Kenya, so it was very pleasing to have been able to do this. The slight trade-off is obviously the Mara is busier than the smaller reserves, but we appreciated our guide’s efforts to be in different areas to the other Jeeps. To travel in Uganda was an unforgettable experience. To see the chimps and the gorillas is truly something worth what we paid. Also, we wanted to say that our guide, Francis, was outstanding. In more than one way, he actually made our trip. Fantastic staff and guide, very welcoming and friendly. Excellent food and the camping facilities added to the experience of being truly in the wild. Highly recommend to people wanting to get a real taste of the African wilderness and a great wildlife safari. LOVED my Letaka guide – he was superb. Loved the camping and the thrill of the unexpected. Did not care for Savuti – we camped far from the reserve and spent too much time driving (4 hrs/ day) through not very interesting landscape just to get to the reserve. This was a trip of a lifetime for both of us. We really appreciated the high end facilities and the warm welcome we received at each stop. The level of commitment to the clientele was evident as we felt special in each place. This was going to be our first and only great adventure to Africa. After day two, We started making plans for our return. This is an amazing experience. I am a very experience professional photographer and my wife is an accomplished interior designer, so not only have we traveled the world, but with a very critical eye. We have now had three safari holidays in Africa with Aardvark and have enjoyed every minute of every holiday but our three days on The Skeleton Coast Safari with Andre Schoeman has be to the pinnacle. We were lucky enough to have the plane, the camps and Andre to ourselves, which made it SO special. Our Namibia holiday experience was really fantastic. We enjoyed it all so much. The Skeleton Coast Flying Safari has to be the highlight as described above. We were impressed with the standard of our guides Jimmy and Max. We had a great time, all went to plan. FYI we thought the Windhoek Hilton was fine for our first night. It has a rooftop bar that overlooks the city and our girls thought this was very cool place, we did too so was a good addition, albeit by accident, to the Olive. Amazing animals and scenery. The best beaches we have ever seen. I had wanted a safari experience closer to the wildlife than a luxury lodge, where I felt like I was part of the bush. Our mobile safari was certainly that and what a treat that we were able to experience it with Grant. From our 12 year old holding an 8 foot python which Grant found, the special birthday cake that the chef baked for my husband to sundowners at our stunning camp sites with no one else around , it was a wonderful experience. Starting in Livingstone with a few low-key days was the perfect way to get over jet lag and acclimatise to Africa. We lived camping with Grant and the Letaka crew and were so fortunate to experience the amazing San Camp. Botswana is a wonderful, unspoilt and wild place and long may it be so! For me, this was the best part of our whole 2 weeks trip. I will Never forget the flying safari. Our pilot Helga was such a competent and fun guide and a real good company. Our children also liked her a lot. For me, this was the most adventurous and a bit scary part and I had to get used to sleeping in the open spaces, listening to all the wild animals during the night. I was not so relaxed. But people feel different about this. But it was all excellent: great guide, great support by the cook and assistant, wonderful food and very good care. 1 week Namibia and 1 week Botswana is a wonderful combination because the countries are so different. The whole trip was perfectly organised and everything worked out perfectly. We can highly recommend everything we did. The safari was magical, and everything I hoped it would be. I went by myself and didn’t know anyone else in the party, nor had I been to Botswana before. I wanted to be under canvas, right out in the bush with lots of animals to see, and it was exactly as described. INCREDIBLE. Best holiday / climb I’ve ever done. Our guide was outstanding and we all had the time of our lives. A long but great route and there was never any doubt that we would get to the top – we were filled with confidence the whole way up! It was all brilliant and a lot of fun. Every camp was different and thus we could see Botswana from different aspects. Mombo in particular stood out. The food, the service, the animals everything was outstanding. Diving was very nice at Mafia, and Marilyn’s snorkeling and cultural outings were great. Incredible. Kili was just out of this world and Zanzibar was a much needed rest after the climb. Zanzibar is fairly limited from an activity perspective but its stunning and if you have a big budget then the opportunities open up a lot. Well worth a visit. Overall it was fantastic and everything that I would have wanted. Saw lots of animals. While the chimps were amazing I will remember the serval the best. The best of over 30 trips. I really had no idea what to expect. It was fantastic… Exciting.. Beautiful, more than I expected. I was glad that I was in physically good shape! Because the riding was constant, walking along on the horses with the surrounding beauty of the elephants, giraffes etc staying quiet and then meeting up with the wildebeest and joining them in a full gallop. Wow, unbelievable! Giraffe Manor was definitely a highlight of this family trip. With only a short time for our vacation, we suggest two nights at Giraffe Manor; three nights in the northern part of Kenya; and three nights in the Massai Mara. The best was following a pack of wild dog on a hunt one dog got an Impala and as they had 9 pups the adults stood guard as the pups ate, also one night at Chitabe we were watching a leopard on a kill in a bush when she decided to give us all a real catwalk performance, she left the kill and walked along a dead branch stopped lay across the branch posing for photo’s just like a catwalk model. The safari highlights included every aspect of this trip. The weather, the camp, the accommodations, the staff, the food beginning with the early morning breakfast in my tent, the mid morning breakfast, lunch, the late afternoon tea and of course the evening meals. A wonderful holiday that lived up to expectations. Would definitely visit Jongomero and Siwandu again as our preference is to be in the bush. But Ras Kutani an excellent place to stay if you want chill out time after a safari. Looking at the entire package, I felt it was a perfect balance chronologically and in its duration, especially since we had previously been to Southern Africa and had seen the Big Five with heavy emphasis on predators. The Serengeti felt very special as we saw all the animals very close with no other people around. Leopard in a tree climbing down, a cheetah, pride of lions with cubes eating a wildebeest then chasing the vultures away. The horseback riding was unbelievable. We really enjoyed all our rides (except the one where the guy was evacuated by helicopter after an accident). The horses were well kept and incredibly fit. They were a lot of fun to ride and very obedient. The guide and camp staff were all excellent. They were cheerful, efficient and capable. The camp itself was basic but comfortable and the staff did all they could to provide us with a good experience out in the bush. The food was delicious and we enjoyed a variety of meals all cooked in a bush kitchen. The Seychelles was the ultimate location for rest and relaxation. I listed some highlights on the lodge individual reviews. The trip was fantastic. We loved everywhere we stayed, and had a very hard time rating one place over another, because they all offered such different things. It was a great mix. Not enough room to tell you. Stretch is probably one of the best trackers possible. His whole team know their jobs inside out. It all works. I don’t have enough superlatives to describe how unforgettable this trip was. I dream of going back there everyday! There are too many highlights to mention but if I have to choose – I will choose the experience of cantering across the delta hot on the heels of a giraffe. Getting “whacked” on the calf by a juvenile gorilla — fantastic! Watching the vet hired by Big Life treat an elephant wounded by local farmers at Ol Donyo — and hearing about plans for an electric fence to keep elephants and farmers apart. This was my 4th safari and it becomes harder to remember what you’ve seen on each one. I will always have a soft spot for my 1st safari in Botswana (mobile camping) as you just can’t ever repeat the first time you see these animals in the wild. Excellent game viewing in Zambia. Lake Malawi beautiful. Friendly people. Wished we’d seen more of the countries and gotten more of a feel for them outside of camps and hotels – it felt very ‘fly in/fly out’ which is not what we do most of on holidays and we really really like ‘the bits in between’. Expectations were seriously high before we went yet we were blown away by how far they were exceeded. Tarangire – a wonderful introduction to our safari. Ngorongoro Crater – glad that we went but crowded and much of the wildlife is rather distant. Northern Serengeti – the absolute best experience ever. Our trip to Kenya and Zanzibar was fabulous! Truly, an unforgettable and memorable experience; one that we will never forget. So many highlights: Leopard dragging its kill down the tree. Sunrise on a pride of lions feasting on their morning kill. Lion cubs play fighting over a bone! Watching the sun go down as a mother cheetah and 3 tiny cubs tuck into their dinner. Zebras on their hind legs fighting. Giraffes neck banging. We had a fantastic family holiday. I was looking for a holiday which all three of my children would enjoy. With two now working and one a student it is increasingly difficult to get them all together in one place let alone find a holiday that suited all tastes. It is a long journey but it all went very smoothly. We had a lovely warm welcome when we arrived in the camp and our whole week was enormous fun and very memorable. The tents were very comfortable and the food simple but good. It should be obvious from the above comments that I had the greatest trip. It all went to plan (as all safaris do that you have organised for me), and I just wish that I had gone for a bit longer and maybe added in another camp. It was a special trip as it was the first time I have been on safari on my own, and I was surprised by how easy it all felt. The highlights were some spectacular sightings at Kaingo & Tena Tena. The Carmine Bee-eaters from the hide at Kaingo were one of the reasons we chose that camp & we were not disappointed. Elephants crossing the river between lots of Hippos was spectacular as was the large pride of lions with cubs & the mating pair. A fantastic trip which enabled us to visit three very different islands. The whole experience was wonderful, excellent planning and we were totally safe to walk/cycle/drive whilst exploring. A great trip. Two wonderful lodges in the Selous where we saw an incredible number of birds and our first ever lion kill. Followed by the fascinating Ibo island and the wonderfully relaxing stay at Quilalea. An excellent combination. Words can not describe how fantastic Botswana was! We had West as our guide who was brilliant, there is nothing about Botswana that he couldn’t tell us. Our back up guide was Tsaone, also amazing. They took great care of us – which we needed a couple of times, especially when we were charged by an elephant and had to make a very swift get away! The highlight for me was our walking safari in the early morning after our night at Beho Beho treehouse, when we met two bull elephants which were in must. The adrenaline rush was amazing! The Letaka mobile safari was all I had hoped for and more. We were a small group of 6 which was just right – I believe the maximum number is 9 and I’m not sure how good that would be with 2 people having to sit inside the vehicle, i.e. in the middle of 3 people. We travelled from Scotland to Zambia & Malawi in August 2013…. Bryan, Jan & Beth (16). As this was not our first safari trip we had some kind of idea as what to expect. The journey was quite long, but we know it is just a means to an end. Singita Grumeti Riding is a private mobile riding safari that takes you from Sasakwa Lodge to camp outs then on to other lodges, all the while riding through starkly varied areas with mixed habitats. It’s super luxurious to boot. I am still stunned by the quality of the equestrian offering at Sasakwa, and the glorious riding country around the Grumeti reserve. It’s a stunning place with lots of wide open plains for fast canters, and lots of wildlife to see as well. Tough slog up the hill. I saw all I wanted to see and compiled a folder of first class photographs. Leopards were seen from all three camps and rhinos from two. The Big Five were seen on one game drive. Lions galore, with kills. A fantastic experience, exceeding all our expectations. With the relaxation and friendliness of Richards Camp it felt like we were stopping with friends living in a wildlife wilderness. We saw everything. All the big five, a Mara crossing, Leopards mating, a pride 22 lions immediately after a kill. The villa with the butler – by Day two, while everyone one else was playing golf or still asleep, the butler had already laid out a towel on the lounger and brought me tea on a tray by the Indian Ocean. I played a game with myself every day trying to sneak out quietly – and always got perfect tea within five minutes. Namibia Horse Safari Company provides some really remote riding through rugged, wired open areas. At night, camp is pretty basic but comfortable. Not for inexperienced riders but a proper adventure! The Namibia Desert Ride was the most AWESOME and memorable thing I have ever done. The beauty of the landscape and terrain is a privilege few can comprehend. Majestic night camps to top of a long days ride with a few good drinks, great food and company. I couldn’t fault a thing and was so, so sad to leave, we have a piggy bank going to raise funds for a return trip. I can’t pick out a favourite thing either, I loved all the horses, the team, the food, the massages, the camp, the warthogs – you name it! Offbeat Riding Safaris is a mobile riding safari and a serious adventure. 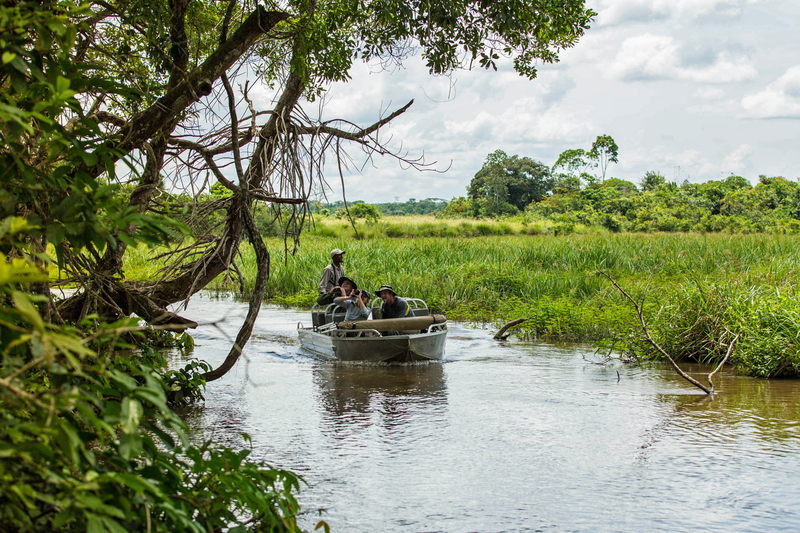 Your charismatic guide takes you on energetic and exciting rides that enable you to get up close and personal with lots of wildlife before heading to a new camp site every night or so. Magical moments that I will always remember. A tribute to the horses and this wonderful, wonderful country. I’ll be back, so watch out and don’t change a thing. The stables at Ol Donyo Lodge Riding Safaris are immaculate. The horses are varied and suitable for all but the riding really suits competent riders onwards. Riding through this magnificent landscape was a dream come true. Well schooled horses, fantastic guides and plentiful game made each day a true pleasure. And then, back at the Lodge, the most exquisite meals, impeccable service and rooms that defy the imagination. Ol Malo Riding Safaris has an amazing lodge in Laikipia looking down onto the Samburo Plains below a very beautiful place. The riding safaris take you through the heart of Samburu land. They also offer mobile camping safaris, etc. which are great fun. This was the best part of my African trip , truly a dream come true. Sosian Riding Safaris is great for proficient, confident riders at Sosian. It’s a fun activity for an afternoon or morning. This week has greatly surpassed all my expectations and I have loved the cool morning rides, meeting zebra and giraffe on the way, the leopard, tracking lion, seeing hippo day and night, the walking, camping in the bush, swimming at the waterfalls, not to mention the amazing food and above all the fantastic team. Fantastic! Some of the best beaches I’ve ever seen and all off the beaten track. The snorkelling and clarity of the water was out of this world. Everything at Okavango Horse Safaris is of an excellent standard. It’s mobile horse safari takes you to a satellite fly camp in a small group of ten or less and we spent our time splashing through shallow floodplains and getting up close to wildlife on horseback. Thank you for an incredible, amazing, once in a lifetime experience. I will carry so many wonderful memories in my heart forever. Your horses are fabulous! Every one of your staff was gracious and made me feel so welcome. Ride Botswana is based out in the Makgadikgadi Pans, which is great going for horses to ride at a pace. It’s magical. You ride out in the afternoon until it gets dark then just as you start to wonder where you’re going to sleep for the night you see lights flickering in the distance and realise they’ve set up camp ready for you! The Pans, none of us had ever heard of them until we were recommended to ride there; oh my goodness, what an amazing, ethereally beautiful place it is, a flat endless expanse of, well nothing really, dotted occasionally with palm islands. Amazed by our guides knowledge! Simply incredible. If you are looking for an African retreat for a whole week of fun and adventure then Ride and Walk is perfect. We spent a week here and didn’t want to leave. There’s so much to do, it’s so totally peaceful and remote, and the hospitality and guiding were second to none. Authentic camping experience in a remote, pristine area with expert guides. We had a wonderful ten days exploring the highlights of Botswana. Fantastic game viewing and seeing the Victoria Falls was a dream come true. A great family holiday and a perfect combination of camps and activities. Keeping four teenagers happy without the internet, clubbing etc. was quite an achievement! Even missing a flight and spending an unscheduled night in Lilongwe didn’t detract from the experience. This really was so much more than I expected it to be with incredibly welcoming and friendly people, amazing wildlife encounters, extraordinary scenery and views. I learnt so much about the culture of each country and driving between areas, whilst long journeys in many cases, was such a great way to travel as you see and learn so much more and I really felt that I got under the skin of the country. Love this place. Scenery is breathtaking. Horses wonderful and the staff should give other companies lessons on customer service – nothing is too much trouble. I loved it here. You can ride at all levels. The new stables are impressive, and you have the choice of Western and English saddles. This is a romantic place and one where you feel supremely relaxed, pampered and at home all at the same time with impeccable service and great staff. Silence, pure silence, apart from the soft sound of horses hooves in the sand and the gentle creak of leather as we move quietly through this immense landscape. There’s the occasional rustle as you brush past a bush, and of course the sounds of the numerous desert birds. Absolutely flawless, from service to people to food. We will miss you all, thank you for making our kids feel at home. We loved every second of our trip. It was the perfect way to get back to the origins of safari and truly enjoy the beautiful surroundings and wildlife. Thanks so much to the Drumbeat Safaris team who looked after us so well. Rides at Desert Homestead Riding are slow or fast depending on the guests and are entirely flexible. Desert Homestead can ride on the adjoining Kulala Reserve. The horses are a mixed bag and I would say there is something for everyone. A wonderful experience – from the Sossusvlei trip to the horse trail sleepout. Food, service, just about everything was PERFECT! The most incredible experience imaginable, it still brings tears to my eyes to think of my holiday at Macatoo. For those who are reading this and wondering whether to try this holiday…do it! It’s worth every penny and then some. Wish I were there. Thanks again to the whole team for a wonderful stay. We hope to be back to Botswana sooner or later and when we are we will definitely come back to visit. Riding with you was definitely the best part of our one month vacation and gave us a true African experience. What a magnificent place to ride. We had a fantastic time here and everyone in our family, novices and experienced alike, loved being able to get close to the wildlife on horseback. Add to that our lovely guides, spectacular rooms and the scrumptious food and we couldn’t have been happier. The horses, about 30 of them, were fantastic. There is also a bunch of ponies which suit kids and beginners. This place is great for riders with non-riding spouses as there’s so much to do from walking, game drives in Lewa and helicopter fishing on Mount Kenya. The flight to the camp is a special part of the adventure. We flew over the delta at low altitude, spotting game as we went then landed on a dirt strip in the jungle. We were met by one of the guides who transported us to camp by game vehicle and a short boat trip. I honestly think I’ve just been on one of the best holidays of my life. It was such a laugh! Six mates with a guide, no unknown tourists, in jokes and all with the same interests. I don’t think there’s a better way to go on safari. The horses here really are a joy to ride. They don’t pull, they’re very responsive and they stop with the lightest of touches. They’re even trained to stop when the guide whistles, which is a pretty good trick. My horse was a 17.0h thoroughbred boerperd cross and what a horse!